Robert Sharpe is well-known as an organ recitalist and for his work with the choirs of York Minster, where he is Director of Music. 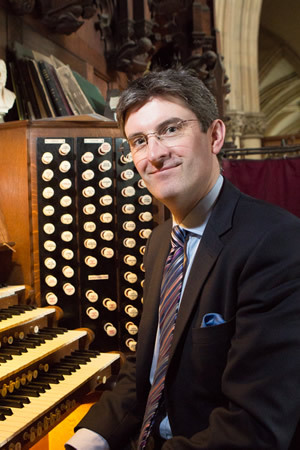 His playing has been described as "dramatic, clear, with appropriate rhapsody, ornamentation and a marvellous sense of timing” [Cathedral Music magazine] and his programmes feature music from all periods, with a bias towards the 19th and 20th century French school as well as 20th century English repertoire and the works of J S Bach; there is always an emphasis on musical contrast and style for each concert. He held positions at St Albans Abbey, Exeter College Oxford, Lichfield Cathedral and Truro Cathedral before moving to York in 2008. His teachers have included Roger Bryan, the late David Sanger and the late Nicholas Danby as well as those with whom he has had the privilege of working, most notably Andrew Lumsden, Barry Rose and Paul Spicer. Sharpe has made many recordings both as organ soloist and with the choirs at York Minster and Truro Cathedral. All have received acclaim from the critics. "Robert Sharpe’s playing of the organ pieces demonstrates artistry of the highest order. His renditions of the great showpieces, the B flat minor Toccata and the ‘Carillon de Westminster’ are exciting... his performance of Op. 62 is especially rewarding: emotionally charged, but perfectly controlled. Robert Sharpe’s performances are captivating."